Create and manage an effective Agile project with Smartsheet. Agile project management is an incremental and evolving approach to software development that adapts well to the changes that occur throughout the life of the project. Agile is a communicative approach that welcomes feedback from end users and encourages changing requirements as needed. In this comprehensive overview of Agile, you’ll find templates to create the most effective Agile project, detailed overviews of principles, values, and frameworks, and a list of projects that work best with Agile. Discover helpful resources to aid in the adoption and implementation of Agile, and guides to help you pick the right Agile tool. What Is an Agile Sprint? What is Agile Iteration Planning? Agile relies on a continuous, cyclic process that encourages flexibility, experimentation, and adaptability. This approach includes cross-functional teams that work on iterations of a product, which is then organized and prioritized based on the evolving needs and wants of the customer. Business stakeholders and developers work hand-in-hand to create a product that aligns with both the customer needs and the company goals. Agile combines each working piece of a project to create the most comprehensive, effective product possible. Requirements Analysis: Projects are envisioned, crafted, and prioritized based on the needs of the customer and the goals of the company. Planning: Teams are formed, appropriate funding is designated, and initial requirements are discussed and formulated. There are only initial requirements, which are likely to change as the process evolves. Design: Development teams work to deliver software based on requirements and feedback. Multiple teams are involved in the iterations of the development and communicate on the progress of each respective step. Implementation, coding or development: Quality Assurance (QA) testing, documentation development, internal and external training, and final release of the iteration go into production during this phase of the process. Testing: Teams continue to create, troubleshoot, and support the software production as it progresses. Deployment: The product is delivered to customers for them to use. Customer notifications and migrations are considered, along with end-of-life activities. Prior to the development of the Agile Manifesto, software development was bogged down, or even cancelled, as a result of changing priorities and poor communication. The Agile Manifesto and the Twelve Principles of Agile Software work to speed up development time, ensure adaptability, and accommodate changing business needs. The Agile Manifesto, in particular, is the core of the Agile Movement and designates the values and principles that drive this flexible process. Individuals and Interactions Over Processes and Tools: The Agile Manifesto designates that people should be held on a higher pedestal than processes or tools, because it is the people who drive the development of software. Teams are more responsive to both change and customer needs, and that communication is crucial to the success of the agile process. Working Software Over Comprehensive Documentation: Delays and setbacks came about during product development due to enormous amounts of time spent on documentation. While Agile does not eliminate documentation, it consolidates it into a single form that gives the developer all needed information upfront to complete the project. Customer Collaboration Over Contract Negotiation: Agile values collaboration as its preferred method of communication, instead of saving discussions for later points in the development process or bogging down discussions before development begins. The Agile Manifesto prefers that customers are engaged and collaborative throughout the entire process, eliminating the need to negotiate at specific intervals. Responding to Change Over Following a Plan: Historically, changes to software development were thought of as expensive, time-consuming, and unnecessary. With the iterations involved in Agile, priorities can be shifted and room can be made for changes in the process as it moves from one iteration to the next. Agile allows for a quick, immediate response to change and does not require an elaborate, rigid plan upfront to designate the process from the get-go. An Agile Sprint, a component of Scrum, breaks down large tasks into smaller, more iterative actions, known as sprints. These sprints are carried out in predetermined time frames and create easier, more achievable goals that can be measured and reviewed after each designated time is completed. These agile sprints are thirty days or less and track progress in a timeboxed effort, meaning it is restricted. The purpose of agile sprints is to coordinate the work of multiple scrum teams, like Large-scale scrum (LeSS), Scaled Agile Framework (SAFe), and others. An Agile Epic is a large series of work that can be broken down into smaller, more targeted tasks, sometimes referred to as user stories. These stories are based on the requests of customers. Agile epics help to further organize work by creating a hierarchical system that establishes the highest priority work that must be completed to progress through a larger project. Epics help teams effectively break down work to continue to move towards a bigger goal. Within an agile project, there is an agile iteration that is based on a decomposition process where tasks are broken into components, called sprints. Sprint planning works to determine the features and functionality in each iteration based on the product owner’s wants and the development team members’ abilities. User stories and backlogs, both product and iteration, are reviewed to develop the list of tasks that are possible to complete during the sprint. This planning process creates a more detailed plan including which tasks are to be performed by which team members and the ideal duration of each task. Based on these variables, an agile schedule can be completed, detailing the activities, testing, design, and involvement necessary to complete a task. Agile is a direct contradiction to the rigid Waterfall approach historically used in software development processes. Agile evolved in response to the difficulty project managers had in using Waterfall, instead creating agile, which focuses on flexibility, speed, and communication. Changes are easily made: With increased communication, short iterations, and cross-functional teams, changes made to the overall project are easily embraced and implemented. End goal is flexible: In projects where the end goal is not already determined, Agile allows for the fluidity of uncertainty. As the project progresses and more variables become known, the goals can be determined later in the process. Speedier delivery: By using iterations, individual teams can hone in on smaller pieces of a larger project and contribute to the stages concurrently. This results in quickly solved problems and easily identified software issues, making the delivery of the end product come at a much faster rate. Strong communication is fostered: Agile encourages increased communication across teams and constant interaction to stay on track. Cross-functional teams are no longer siloed, and responsibilities are widespread across specific parts of the project. Customer input is encouraged: The customer holds the ability to see the work across any and every point of the process. The customer can track goals and see milestones achieved, making sure their ideal end product is achieved. Improvement is constant: Feedback from users and team members contribute to a steady rate of improvement for each project. Less concrete planning: Agile is framed around a time-boxed delivery and priorities are constantly being renamed, making it hard to nail down a set delivery date on projects. Additionally, sprints or iterations can be added to the project strategy, increasing project timelines and pushing back previously set deadlines. Team members wear many hats: Agile teams are generally small, so all team members must be knowledgeable about a variety of processes, along with the Agile methodology itself. Complete dedication from developers is needed: Agile is the most successful when developers are fully committed to the project and constantly collaborate throughout the process, which requires more time commitment. Final product can differ: Because the initial Agile plan might not be set, the actual final product can vary greatly from what was proposed. Agile is very flexible throughout the entire project, so iterations can be added, customer feedback can alter plans, and timelines can change, resulting in a potentially new deliverable. 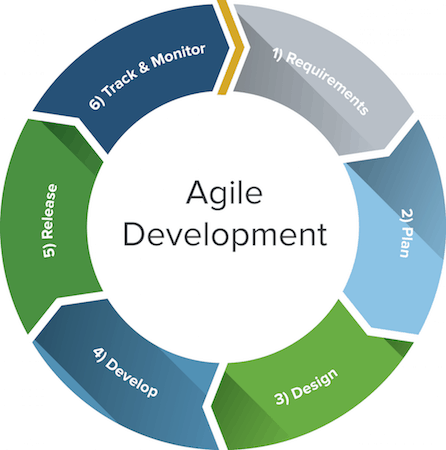 Agile offers a rapid and easily followable roadmap into software development, identifying key targets achieved through open communication, flexible targets, and encouraged feedback. Agile processes are great to use when needing a plan with iteration stages that can be tailored for the customer as the end target shifts or the end goal is created. Agile requires less upfront planning and rigid, linear structuring. Instead, this process allows for rapid feedback and incremental updates throughout the process.